Peter Kelly, who has died aged 74, was voted “political rookie of the year” at Leinster House back in 2002. It was an honorary title bestowed with great good humour on a newcomer who made the biggest social impact among political colleagues across all parties. It was also an unlikely title to give a man of 58 years of age. But the gentle incident tells a lot about the former Longford Fianna Fáil TD whose hallmarks were a great self-deprecating sense of fun and considerable kindness. 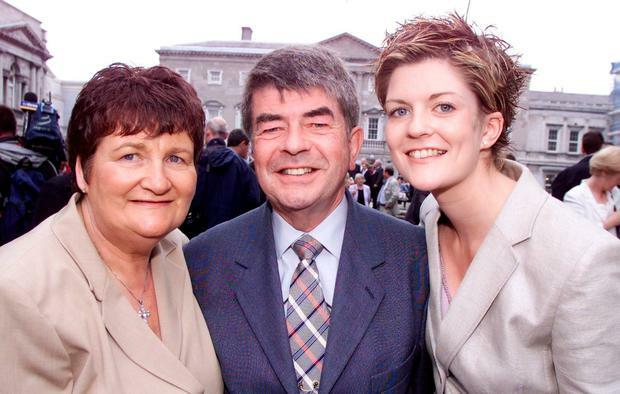 He was intensely proud of getting elected to the Dáil for his native Longford in the May 2002 General Election. During his first term there, party leader Bertie Ahern was battling with the fruits of political success, with several restive backbenchers smarting at the lack of promotion. Peter told colleagues how he had met the party leader in the corridor and addressed the issue of promotion head-on. “I said: ‘No, I don’t want a junior ministry – and under no circumstances are you to put me in that cabinet,'” he mocked. An impatient colleague, irked at the mocking tone, quickly accused him of lacking ambition. “Oh yes, I have ambition – I wanted to be the TD for Longford and I’ve done that,” he shot back. The anecdote tells much about his sense of humour and his take on politics and life in general. He was a publican and funeral director in Longford town, next door to the courthouse, for many years. The Kelly family had been in business in Longford since the turn of the last century. His lounge bar was something of a local institution until he finally sold the business in 2001 and the premises was incorporated into the expanded courthouse. A strong supporter of Taoiseach Albert Reynolds, he was first elected to Longford County Council in 1985, and would later serve as council chairman in 1996-1997. He succeeded his old friend as local TD when Reynolds retired from politics in 2002. Originally elected for Longford-Roscommon, he was later re-elected for the redrawn constituency of Longford-Westmeath in May 2007. He quit politics before the 2011 General Election but still visited Leinster House. Mr Kelly was a strong advocate for his native Longford. Paying tribute to his former colleague yesterday, Fianna Fáil leader Micheál Martin stressed his affection for his hometown and the seriousness with which he sought to represent his people. A dedicated Fianna Fáil member, he served on the party’s national executive from 1997 until 2002 and he was well known to party members around the country. Mr Martin also acknowledged his work for the party over the years, which continued up to recently. A local political colleague, Cllr Joe Flaherty, described his friend as “a local colossus” devoted to his family and his native place. “I was extremely fortunate to have known and worked with Peter for many years. There wasn’t a man with a bigger heart or a man more committed to the Longford cause,” Mr Flaherty said. Mr Kelly was always a great source of political lore and his stories rarely lost anything in the telling. Many of them involved the late Mickey Doherty, another renowned Longford political character, who had been a councillor and senator and mentor to Mr Reynolds. In the early 1990s, Mr Doherty inadvertently sparked turmoil on the EU money markets by explaining Mr Reynolds’s absence at the time of a leadership heave against Charlie Haughey. Mr Doherty fibbed that Mr Reynolds, then the finance minister, was at EU talks about the European currency grid, the troubled EMS. The money market frenzy took several pfennigs off the deutschmark. Mr Kelly died peacefully on Wednesday night after a short battle with illness. He is survived by his wife Maura, two sons and one daughter.